Well I have done 28 days on Personal Trainer Food. I have lost a little over 20 pounds!! Yeah for me! I really wanted to lose a bit more – but I know 20 pounds in a month is really good. I still can’t see that I lost any weight – but I think that is because I really need to lose a lot more. 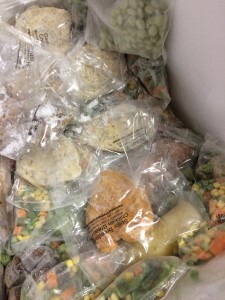 I am doing a another 28 days a nd the food came on Saturday – here is what it looks like when it comes. The first month I did the “Rev” which had an omelet and protein for breakfast, vegetable and protein for lunch and 2 vegetables for dinner. This month I am doing kind of the same thing – but dinner is 1 vegetable and a protein. I am hoping to lose another 15-20 pounds this month. One of the nicest thing about the Personal Trainer Food is the hands on approach. Each week I received a call from one of the weight lose coaches. They really have good suggestions on how to get the most out of the program, they are friendly and offer lots of encouragement! I am excited to start my second month of Personal Trainer Food! I have been doing really well and have followed the programs with no miss steps! I will keep you updated weekly on how I am doing and at the end of the second month I hope I can see a difference! I will then have a before and after photo so you can see how well this program works when you follow it correctly. I hope everyone has a great week! I noticed Personal Trainer Food has a special this week – get one week free ( $108 off) use the code FREEWEEK when you check out to get the discount. The warmer spring like weather is (nearly) upon us. So it has got me thinking about my spring and summer wardrobe. There are a few things that come out year after year and never go out of style. It is nice to add new things each season, though, right? So, to save Y’all some time, I have put together a list of some of the things that will be in style this coming season. I’m not saying I will be wearing all of them, but they are all hot trends to look out for. This is a fun trend that you’ll see cropping up. Whether it is with a jacket or a skirt, suede, with a look right from way back when is set to popular. It is a fairly safe look I would say and pretty much everyone can wear it. I can’t see it working too well when the weather is super hot, though. What are your thoughts? Spring and summer and a time for flats I think. Flip flops and sandals are the best just to throw on when it is warm, or you are on vacation. Flat mules (or outdoor slippers as they get quite often called) are going to be popular. Yay for fashion and comfort! They may not be everyone’s taste, though. But if it is good enough for Victoria Beckham, right? Hallelujah and another amen for a comfortable and stylish trend. Pleats are so easy to wear and so easy to care for too. They wash on cold and then just need to be hung to dry naturally. They don’t crease up like silk or cotton, so they are perfect for wearing or summer trips. I love pleated skirts and dresses and think that this style trend is awesome. Lightweight denim is a great option for spring and summer. So if you have a denim skirt, dress or shirt, then be sure to pull it out. It is an easy to wear look that looks great with some clogs or sandals. Half moon shaped bags are pretty stylish this season this season. So grab a light brown leather half moon bag and team it with a denim dress. Some bold eyewear would look amazing too. Forget Heidi-style braids, this is how to work the season’s prairie-peasant style vibe. You could go for extra style and perhaps go for a ruffled style too? The great thing about this is that it can also be worn on cooler days. When the weather can’t decide what to do, you can just layer it up. This is another great style that is easy and comfy to wear. When you don’t want to wear sandals, having a pair of sneakers to grab is great. You should keep them plain and simple. A plain style is best, particularly if they are bright white. This is one we can all add to our shopping list, right? So easy to wear, perhaps with a denim skirt. When I take a shower I love to exfoliate my skin and I found these Eco Friendly Body Scrub exfoliate Gloves Pack. They are from Thermalabs #thermalabs. They are made out of bamboo fiber, loofah, jute and sisal that will help you exfoliate and scrub your skin the way YOU want it, each in it’s own natural and phenomenal way. Exfoliating your skin helps remove dead skin and unclog pores. It helps makes your skin glow and look healthy. I love the way my skin looks and feels after using these exfoliating gloves. Using them helps make my skin nice and smooth. It is also invigorating to use the gloves on my skin. It gets my blood circulating and gives me healthier skin. 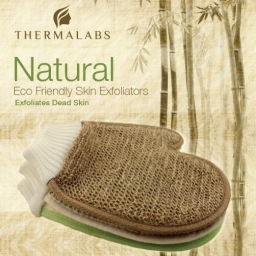 I really like the Eco Friendly Body Scrub Exfoliator Gloves they are well made and are durable. I use them in the shower every morning. They feel good on my skin – not too rough. If you would like to purchase these great Eco Friendly Body Scrub Exfoliator Gloves for yourself you can purchase them on the link below from Amazon.com. Need to cut down the contents of your overcrowded make-up bag? Or want to ensure you always have the basics on you? These are ten beauty items you’ll always want to have close at hand. Whether this is a bold red, a vampy purple or a classic pink, every woman needs a signature lipstick. If it’s an affordable brand, keep one at home and one in your handbag so it’s always close at hand. A quick swipe of colour over your lips can brighten your whole look. A concealer in the wrong shade is about as effective as no concealer at all. In fact, it might well be even worse because it can draw the eye to what you’re trying to cover. A concealer should disappear into your skin when you apply it, and look natural. This is how you know you’ve found the right one. You also want it to be long-lasting so you don’t have to worry about top-ups. Once you’re out and about, your hands and fingers will be getting dirty. Touching blemishes with dirty fingers is a no-no, so make sure your concealer is up to the task. As with concealer, foundation that is not in the right shade can make you look worse. To prevent tidemarks, always blend it right down to your neck, over your ears and up to the hairline. The better quality the brand, the better products. ABH products are a great example of this. Eyeshadow that rubs off after an hour is no good at all! Invest in a neutral coloured eyeshadow with lasting power. If you already have lots of eyeshadows, invest in a eyeshadow primer instead. These will help keep it in place. Life is busy, and sometime washing our hairs task priority. Keep a bigger bottle of dry shampoo at home, and keep a travel sized version on you. It really is a miracle product for freshening up limp, greasy locks. Plus it will tide you over until you next have time to wash your hair. An essential in every woman’s arsenal. Brown, clear and coloured mascara is great too, but a standard black version is a necessity. One of the most versatile products out their, Vaseline can help with a number of things. It can act a highlighter on cheeks, and to tame brows. Some people also claim that it can make eyelashes grow this. Oh and let’s not forget about using it on your lips. Clear nail varnish is not only great for nails, it can also help stop tights ladders in their tracks! Tweezers aren’t just handy for hair removal. You can use them to apply false eyelashes more easily, and to pick up small objects like gems if you’re doing something fancy with your nails. Not only will a setting powder keep your makeup in place, it will also reduce shine. Plus it will stop your makeup from running if you’ve got a frantic day ahead. Keep in your handbag for top ups. As I get older my skin gets drier and needs help replenishing moisture. Here is something I found really helps keep my skin soft and moist ~ it is from Citrus Clear and is their Skin Repair Organic Moisturizer. The moisturizer smells great! It has a nice citrus smell. The Skin Repair Organic Moisturizers uses organic aloe vera, vitamin C and essential fatty acids to help keep your skin moist. By replenishing the moisture that your skin loses natural it helps reduce fine lines and wrinkles. The vitamin C helps reduce the discoloration of your skin. Because this product is organic everything in it is good for you. With extended use your face will look fantastic and younger looking! I am using the Skin Repair Organic Moisturizers twice a day. It has a nice texture and my skin loves it. When I put it on in the morning and evening my skin just soaks up the lotion. It does not leave a greasy residue just nice soft skin! 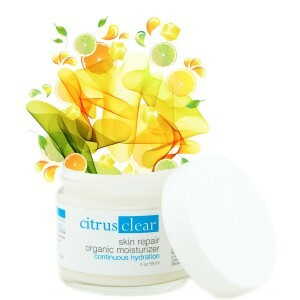 If you would like to purchase Citrus Clear Skin Repair Organic Moisturizer for yourself you can find it HERE. 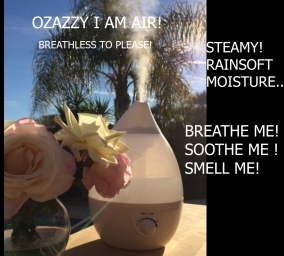 This is a really helpful product – it is a Ultrasonic Cool Mist Aroma Humidifer #IAMAIR. I originally thought this would be great for using my essential oils – but it is good for so much more. It is a aromatherapy diffuser, humidifier, air home purifier, ionizer and LED baby mood lamp all in one! I have asthma and need the humidifier to help me breath better. I just put 3 drops of essential oil in the tank and the room starts to smell good and I can start breathing better. Also my skin feels moist and soft. The ultrasonic cool mist 360 degree rotating steam nozzle puts out 2.3 gallons of wellness moisture per day and humidifies rooms up to 250 square feet. It is also great in a bedroom – it has LED light that changes colors and if you put lavender in the water it will help you sleep better. It is quiet and you hardly know it is on. The nice thing is if you have it on and it runs out of water it turns itself off. It is something we use almost every day. If you would like to purchase your own Ultrasonic Cool Mist Aroma Humidifer you can do so on the link below from Amazon.com. Today is day 18 on Personal Trainer Food Rev Program. I am excited to say I am down 18 pounds! I can’t tell you how good that feels. I think one of the reasons I am doing so well is that I have all three of the meals prepared for me. All I have to do is heat and eat. I have wanted to eat other things – but I have resisted and the good thing I have seen the results because of it. 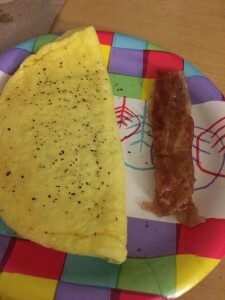 Here on the right is a picture of my normal breakfast – today it was a cheese omelet with bacon. All I have to do is put in the microwave for 2 minutes and then eat. I could ad some veggies to the top if I wanted to spruce it up. 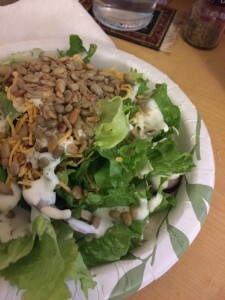 Here on the left is the salad I have with my lunch ~ today my salad had lettuce, green onions, cheese, sunflower seeds and ranch dressing. After eating my salad I have my lunch which was chicken and veggies. Tonight will be some more vegetables and a bit of the protein that I make for Rex. I try to walk on my lunch but if I don’t, I make sure I do once I get home. On this program you are not required to do hours and hours of exercise to help lose. They recommend at least 20 minutes of walking (2,000 steps) each day. Any program you follow will help you lose weight – but it needs to be something you can follow. I have tried all kinds of weight lose programs but so far this one seems to work the best for me. I am very determined to lose weight. I have been thinking about how much extra weight I am carrying ~ no wonder why I am so tired. Have you ever walked around with a 20, 30, 40 or even 50 pound weight all day? Do you know how hard it would be to do that? Yet I do that every day and don’t think anything about it. Well that is changing. Little by little I am losing that extra weight – and I can’t wait to keep losing! If you are looking for a weight lose program you may want to try Personal Trainer Food. The nice thing is there is always someone around to answer your questions either by e-mail, phone or even on chat. You can find more information HERE on the different programs Personal Trainer Food has and right now they have a special giving you a $100 off your first months food. I have wanted a duvet for a long time. 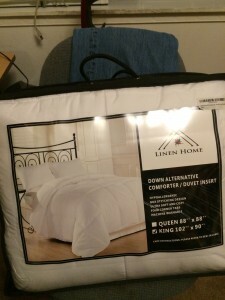 I was very happy to try this medium weight duvet from Linen Home Pro #LinenHomeDownAlternativeComforter. It came in a plastic cover so that if you are not using it right away you can store it without it getting dirty. I have allergies so I need a duvet that won’t make me sneeze or tear up. This duvet from Linen Home Pro is 100% Hypo-allergenic. It is made with a microfiber fill for an allergy-safe alternative to down. I really like how soft it is. It is light enough for summer and warm enough for winter. 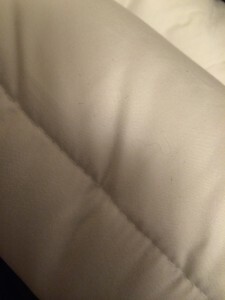 The duvet has nice stitching and looks like it is very well made. It is machine washable. In fact I have washed it and it looks great. I don’t see any loose strings and it still looks as fluffy as it did when I took it out of the box. I think this will be a duvet that will last a long time and get lots of use from us. If you are looking for good quality, soft warm duvet this might be the one for you. If you would like to purchase your own Linen Home Pro duvet/comforter you can purchase it on the link below from Amazon.com. I have been looking for a garbage can for my car. I had one but it really didn’t work for me. This one from Drive Auto Products is perfect. It is a Graphite Gray 16″x9″ Poly-Nylon container. The stitching looks nice and are strong. The container is durable and should last a long time. One of the best things is that it came with plastic garbage bags. I like that it helps keep my car clean. I hate not having a place to throw wrappers and before ended up putting them in my purse or a bag. Now it is simple for everyone in my car to unwrap a straw or snack and throw away the wrapper instead of letting it fall on the floor. This is one of the best purchase I have made in a long time. 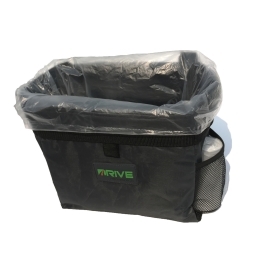 If you would like to purchase your own car garbage can you can do so HERE. This is my second week of Personal Trainer Food. I am really liking the program. Sure I miss bread but I am excited about losing weight. Today is day 11 and I did weight myself and I am down 15 pounds! This week was a bit hard at the beginning; I was so tired! The great thing was I just contacted my coach at Personal Trainer Food by e-mail and Tamela got back to me within a few minutes. She said that the fatigue was part of the sugar withdrawals and was normal. It takes your body a while to adjust to not running off the sugar. Tamela also gave me some hints on how to help get over the tired feeling. She said that I need to drink lots and lots of water and to start eating an apple in the afternoon. It sure is nice knowing that help is only an email or phone call away. I do think one of the keys to this plan is drinking a lot of water – which I do. One of the other success of this program is that the food taste good! I have liked everything I have tried so far. My favorites are the teriyaki chicken and the spicy breaded chicken breast ~ but all of it has tasted good. Today is also no cook Friday (something my boyfriend and I do every week). Tonight we are going out to dinner, but I am not worried. I already looked at the menu and know that I am going to order a cheeseburger no bun along with a side salad. I have had really good success so far and do not want to ruin it by eating something that would stop my weight lose. That is the biggest thing I have to remind myself ~ the program is working. Don’t ruin it by eating something with sugar or carbs in it. It will take days for your body to get back to burning fat instead of sugar. Personal Trainer Food is a program that I really like. I am already looking past my first 28 days and getting ready to order my next shipment of food. I am excited for my weight lose and excited because I am feeling better about myself! If you are interested in trying the Personal Trainer Food program you can find all the information HERE. I noticed they also have a special right now for $100 off your first order. I will be back next week to tell you more about my success with Personal Trainer Food! I will have some more pictures for you too – for some reason I can’t get them to download from my camera today.